A tasty morning treat with ham, eggs, and other good things. Preheat oven to 375 degrees. Grease 4 ramekins or giant muffin tin. Line with ham slices. 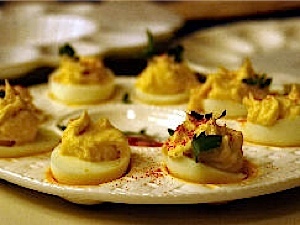 Beat eggs, mustard and yogurt. Stir in 1/2 of cheese and half of herbs. 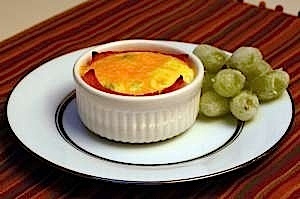 Stir well and spoon into ramekins. Sprinkle with remaining cheese and herbs. Bake 25 to 30 minutes until set. Turn out onto plates and garnish with herb sprigs. Serve with hot toast. Preheat oven to 400. Combine flour, baking powder, soda, salt and sugan in a large bowl. Cut chilled buter into small pieces and blend quickly and lightly into the flour mixture using a pater cutter or your fingertips. Do not overblend buter. Stir fruit and ginger into flour/butter mixture. Mix egg yolk into buttermilk. Lightly stir butermilk into dry ingredients until just mixed. Knead the dough briefly on a lightly floured board. Form into a round and cut into 8 sections. Beat the egg white lightly and brush it over scones. Sprinkle with raw sugar. Place on parchment-lined baking sheet and bake 20 minutes until lightly browned. Line a sieve with cheesecloth or paper towels and suspend it over a bowl. Pour the yogurt into the sieve and allot it to drain, refrigerated, for 3 hours or overnight. Place the thickened yogurt into a medium bowl and stir in the cranberries, walnuts, vanilla, honey and zest. 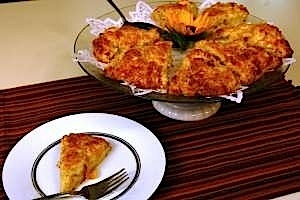 Thin with orange juice until it is of desired consistency. 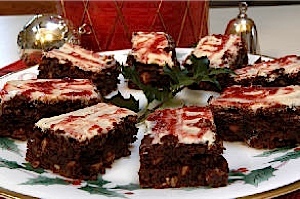 Garnish with orange sections, zest, cranberries or walnuts and serve. 40 short (6″) wooden skewers or toothpicks. 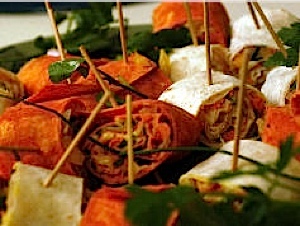 Lay out tortillas, Spread hummus thinly over the entire tortilla to the edges. Sprinkle other ingredients evenly over tortilla. Roll up tightly as possible adding hummus to seal edges. Press to “glue” it all together. Use a serrated knife to cut off uneven edges. Cut into 2″ pieces. 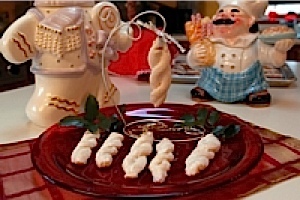 Pierce with skewers and arrange on a tray and serve. Makes 40 piece more or less. TIP: I section off ingredients into 8 even piles before I start so I have the correct amount for each of the 8 tortillas to fill. 12 thin stalks asparagus blanched in boiling water until tender but still firm. Combine Olive Oil, vinegar, mustard and garlic. Whisk well. Stir in chives, salt and pepper. 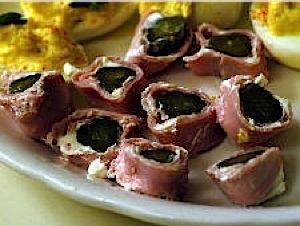 Spread each slice of prosciutto with 1/2 tablespoon cream cheese. 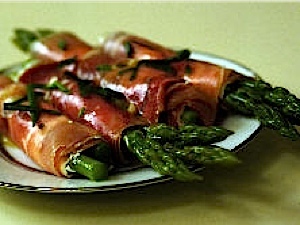 Roll three stalks of asparagus into each slice of prosciutto. Top with vinaigrette. Each should take easily less than 5 minutes! 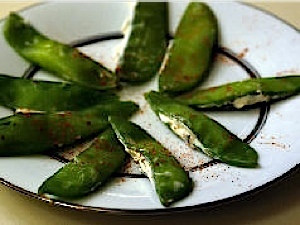 Remove the stem end from the snow peas, string them and blanch in a large pot of rapidly boiling water for 30 seconds. Plunge them immediately into cool water to stop the cooking and preserve their green color. With the sharp point of a paring knife slit open the straight seam of each snow pea. 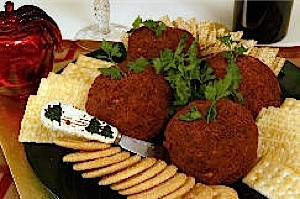 Pipe or spatula cheese into each one using a small-tipped pastry tube or spread with a spatula. Garnish with your favorite herb. Form into balls and then flatten. At this point, you can freeze the crab cakes for later use. Saute in butter until brown. Then bake at 350 degrees for 5-10 minutes. 3 tbsps or so of Dijon mustard. Thin to desired consistency using a good honey. Lay out the ham on a clean cutting board. Blot top with a paper towel to remove extra moisture so that the cream cheese will adhere. Spread a thin layer of cream cheese over the ham. Please a pickle or two along the short edge of the ham slice. Roll up as tightly as possible. Seal the open edge with a bit more cream cheese. Slice with a very sharp knife discarding the two “raw” edges (those are for the cook to nibble on!). Please the sliced rounds on to a decorative platter and serve. YUM! In a food processor, shred 1 cup of Chinese (Napa) cabbage. Process this in your food processor or mixer until it forms a dough. or a glass (in my opinion, this is the easiest method but not everyone has a pasta maker. These are not that expensive – about $50-60. I am talking about the manual kind). Put about 1 tbsp filling onto each dough round and seal. 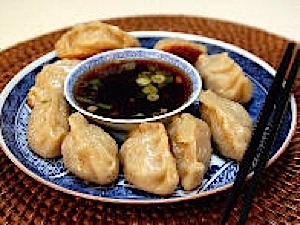 At this point, you can pleat the edges to look more like the traditional pot stickers but you do not have to. They will still taste the same). Heat the sauce for about 3 minutes until sugar dissolves and set aside. Sprinkle with chopped scallions before serving. In a large non-stick fry pan, heat 3 tbsps olive oil. Saute the ravioli until the bottoms are golden brown. Pour in about 1/3 cup chicken stock (from a can or home made). Immediately cover and steam over medium/low heat for about 4-5 minutes. Remove the cover and continue to cook until all the liquid is absorbed. 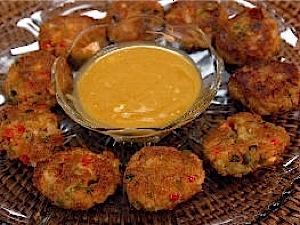 Remove from the pan and serve with the dipping sauce. ENJOY! Soften yeast in 1/2 cup water (110 degrees). In saucepan, combine sugar, shortening, milk and salt. Heat, stirring until sugar dissolves. Place in large bowls and cook to lukewarm. Stir in 1-1/2 cups flour, beat well. add softened yeast and eggs. Beat thoroughly until smooth. Stir in enough remaining flour to make a moderately stiff dough. Place in a greased bowl and let rise about 1 to 1-1/2 hours. Punch down. Into greased muffin tins, shape 3 small round balls of dough into each compartment. Let rise until double in bulk. Brush with melted butter and bake 10-12 minutes at 400 degrees. Preheat oven to 350. Butter a 13″ x 9″ baking dish. Arrange corn bread on a baking sheet and toast in the oven for 20 minutes. In a small saucepan over medium heat, warm stock. remove pan from heat and add the dried cherries. Let cool. In a fry pan over medium heat, warm olive oil. Add bacon and saute, stirring occasionally, until golden and crisp, about 5-7 minutes. Transfer bacon to a paper towel to drain. Add onion, celery and carrot to the pan and saute until soft and translucent, about 5 minutes. Season with salt and pepper. Prepare the white sauce mix as indicated on the package. The sauce mix will call for milk. Once the sauce mix is prepared pour into an oven proof casserole dish. Drain the jars of onions well. Gently mix the onions into the white sauce mix. Season carefully with salt. Add black pepper. Mix well. Sprinkle a touch of paprika on top for color. Heat through on a low oven, 350 degrees for 10 minutes or until heated through. Garnish with finely chopped flat leaf parsley. Beat the 9 eggs yolks in your mixer until they are thick and light. In a small saucepan, combine 1 cup sugar with 1/3 cup water and bring to a boil over medium heat. continue to boil until it reaches 230 degrees or the softball stage (you need a candy thermometer for this). Pour the syrup over the beaten egg yolks while your mixing is on low. Continue to beat for about 10 minutes until it is very creamy. Add in 1/3 cup dark rum and combine. In another bowl, beat 3 cups heavy cream until it holds soft peaks. Add 1 cup maple syrup and continue to beat until it holds hard peaks. Fold this mixture into the egg yolk mixture, trying not to deflate the cream. In another bowl, place the 9 egg whites and a pinch of salt. Beat them until they form stiff peaks and then fold them into the egg yolk mixture and combine well, folding so not to deflate the whites. Fold in the 2 cups of ground walnuts. 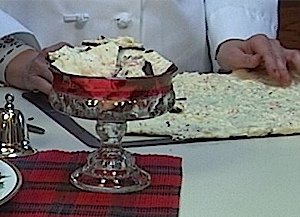 Have a souffle dish ready with a wax paper collar tied on with string. Pour the mixture into this mold and place in your freezer overnight. In a large pot combine sweet potatoes, apple cider and water. Bring to a boil then turn down to a simmer and cook 35 minutes or until the potatoes are tender. In the same pot bring the butter and maple syrup to a boil. Add the potatoes and toss. Working in batches, puree the sweet potatoes in a food processor, do not over process. Or, mashed by hand until creamy. Season with salt Set aside. In a skillet, cook the pecans in butter over low heat and sprinkle with salt. sautÃ© until well-coated, stirring occasionally, for about 5 minutes. transfer the pecans to paper towels to drain. 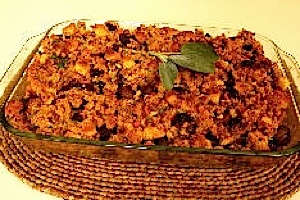 Turn the sweet potatoes mixture into a beautiful low and wide casserole dish. Spread out evenly. Arrange the pecans in a pretty pattern on top of the potatoes mixture and sprinkle with brown sugar. Bake at 300 degrees until heated through about 20 minutes. One pound fresh green beans cleaned and trimmed. 6 slices bacon cooked until very crisp. Cut the green beans on an angle into bit size pieces. Cook in the salted boiling water until just tender. Plunge immediately into an ice water bath to stop the cooking. Drain and set aside. Chopped or crumble by hand the crispy bacon. Thinly slice the mushrooms and sautÃ© in butter until just golden brown. 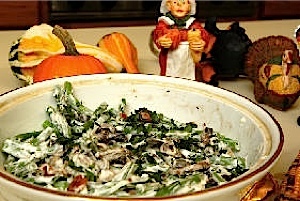 In a large bowl combine the green beans, bacon and mushrooms. Season with salt and pepper. Remember the beacon is salty so go easy on the salt to taste. Gently mix in the sour cream. Toss until all is coated and combined well. 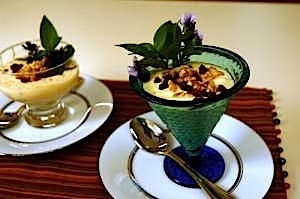 This recipe is from my mother, Ruth. It is fabulous! The wonderful thing about Ruthie’s Beans is that it can be served after making it , at room temperature. It can be refrigerated and served chilled. And if you make this a day or two ahead, it can be gently reheated in a low 325 degree oven until warmed through. 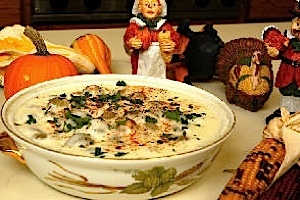 This dish was always present at every Holiday table through the year. Preheat oven to 425. Butter or spray with non stick spray a glass pie dish. Measure flour, sugar and nutmeg into a large bowl. Stir to blend. 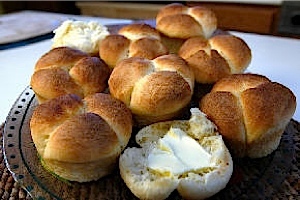 Cut cold butter into 1/2″ cubes and blend, along with the shortening, with a pastry blender until mixture is very coarse. Beat egg, juice, and water together and add to flour/butter mixture. Blend together with a fork to moisten dry ingredients. Using your hand, quickly pull mixture into a ball. If mixture remains dry, add approximately 1 more tbsp ice water. Mix with hands quickly to form a ball. Sprinkle a surface liberally with flour. Cut dough in half. Flour rolling pin and place 1/2 dough on surface and flatten gently with your hand. Begin rolling out from the center- do not roll the pin off the edges of the dough. Rotate dough and pull more flour under to prevent sticking. Reflour pin as needed. Continue rolling in this fashion until the dough is about 1/3 larger than the pie plate. Gently fold dough over itself and place in prepared pie dish. Then gently unfold the rest of the dough, pushing the dough into the dish to make a snug fit. Dot bottom of shell with 1 tsp butter. Roll out the other half of the dough in the same fashion. Peel, core and slice the apples. Set aside. Mix remaining ingredients (except the butter). Sprinkle 1/2 of the sugar mixture on the bottom of the pie shell. 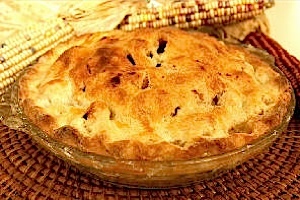 Fill with apples, piling high in the center. Sprinkle the rest of the sugar mixture ovefedges. Make 8-10 steam vents with a sharp knife in top of pie. Using your fingertips, gently pat milk on top of shell. Dot with remaining 1 tsp butter and sprinkle with sugar. A little cinnamon and/or nutmeg can be sprinkled on top also. Preheat oven to 375 degrees. In large mixing bowl with electric mixer combine butter, shortening, sugar, egg yolk, vanilla and salt, beating until light and fluffy. Blend in flour gradually on low speed. In small mixing bowl, slightly beat egg white. Form dough into 1 inch balls; dip into egg white. Roll each ball in sugar or chopped nuts. Place on ungreased baking sheet. 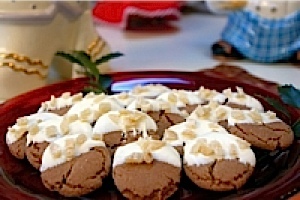 Using thumb, form a depression in center of each cookie. Fill with 1/2 teaspoon of jelly or jam. Bake cookies 12 to 15 minutes until set and very light brown. Cool on wire rack. Store cookies tightly covered. All ovens vary in temperature and I have found that if you bake the UNFILLED cookies with depression for 5 minutes then remove from oven, fill with jam or jelly and bake for an additional 7 minutes. Bake brownies according to package directions. As baked brownies cool, loosen with a knife around edges of the pan. When brownies are completely cooled, remove from pan by turning upside down on a rack. In the top of a double boiler, over simmering water, melt 1 full box of peppermint candies. Remove from heat when chocolate is just about melted. Stirring to keep mixture smooth. Grind ingredients and mix with Â¼ cup olive oil. Mix until creamy. Mold into a round apple shape and roll in paprika. 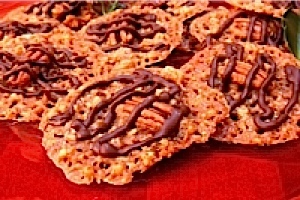 Refrigerate to solidify and serve with your favorite crackers. Melt shortening and butter over low heat â€“ cool 15 minutes. eggs until blended. Stir in remaining ingredients. cookie sheet or sheet lined with parchment or silpat. Bake 10-12 minutes or until set. Cool 1-2 mins and remove to wire rack to cool completely. When cool, melt 1 package white chocolate chips in microwave or 1 minutes to 1 min. 20 second or until fully melted. Dip one half of cookie into chocolate, place on wax paper, and decorate with a couple of pieces of chopped candied ginger. Line baking sheets with foil or silpat. In medium saucepan, combine butter, brown sugar, and corn syrup. Cook over medium heat until butter melts and mixture boils, stirring constantly. Remove from heat. 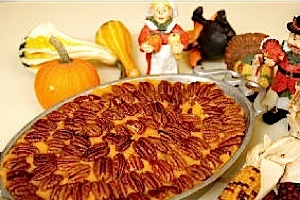 All at once, stir in flour, chopped pecans and rum extract and blend thoroughly. Working quickly, drop by half-teaspoonfulls onto sheet. Insert one whole pecan in center of cookie. Bake 8-9 minutes or until golden brown. Remove from oven and cool completely. Do not remove from foil lined sheet. Let chocolate set before storing â€“ these freeze well in freezer bags for 1-2 months. *You can use a freezer zip loc bag to create a piping bag â€“ melt your chocolate, pour into bag, and snip a small opening in corner of bag and pipe zig-zags of chocolate over the top of each cookie. Pre-heat oven to 350F (325F for dark or glass pan) Butter or spray with cooking spray a 9 x 13 pan. Measure flour and sugar in bowl and mix to blend. Cut cold butter in small chunks into bowl. 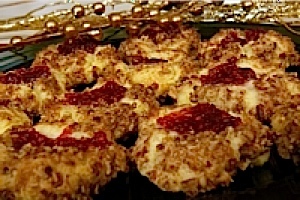 Mix with pastry blender until mixture resembles oatmeal. Pour mixture into prepared pan. Spread mixture evenly over pan and press, with hand, evenly into pan. Bake for 15 minutes. Mix, in a medium bowl, milk, eggs, vanilla, candy and pecans to blend. When crust has completed cooking (it should be golden brown around edges) remove from oven and pour the nut mixture over the base. Smooth out and return pan to oven. Bake for 20-25 minutes. Center of bars, when pan is gently shaken, should not be loose. Place on a cooling rack. After a few minutes, loosen the edges of the bars with a knife in order to prevent sticking when ready to remove from pan. Pre-heat oven according to package instructions. To mix brownies: Pour mix in to a large bowl. In another bowl pour in required oil. In a liquid measure cup put 2 tablespoons raspberry liqueur and enough water to fill the required amount of water on the package instructions. To this add the eggsâ€”the number for the texture desiredâ€”and Â¼ cup raspberry jam. Whisk to blend and add to brownie mixture. Incorporate according to package instructions. When blended add the chopped almonds. Stir to blend. 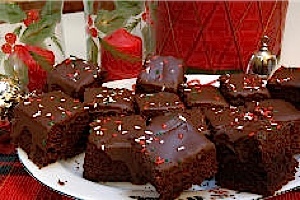 Spread brownie mixture in pan and bake according to package instructions. When brownies are baked, remove from oven to a cooling rack. After a few minutes, loosen brownies, with a knife, from the sides of the pan. Allow to cool completely. When cool. Remove brownies from pan by turning pan upside down on a rack. In the top of a double boiler, over simmering water, melt the white chocolate, stirring occasionally until smooth. Remove the top of double boiler and insert a cup holding the remaining jam and liqueur (remove pan from heat). Allow this to heat while spreading white chocolate. Mix butter, sugar, and vanilla thoroughly. Sift flour and mix in salt; blend. Mix in nuts. Chill dough. Heat oven to 400 degrees. 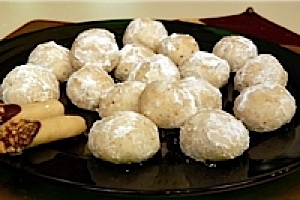 Roll dough in 1″ balls. Place on ungreased baking sheet. (Cookies do not spread.) Bake 10 to 12 minutes or until set but not brown. While still warm, roll in confectioners’ sugar. Cool. Roll in sugar again. Makes about 4 dozen 1″ inch cookies. Mix sugar, butter, milk, vanilla and egg until creamy. Stir in flour, baking powder, and salt. Cover and refrigerate at least 4 hours or until chilled. 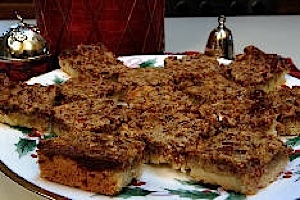 For each cookie, roll a walnut-sized piece of dough into a long log, about 9â€ long. Cut in half. Press 2 ends together to seal and then twist into rope shapes and seal ends. Place on an ungreased or silpat/parchment lined cookie sheet. If you want to use these as ornaments, take a straw and make a hole in the cookie at one end. Bake 5-7 minutes or until set and light brown â€“ not too brown! 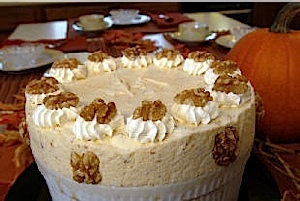 Decorate with icing (below) and sugar. Mix all ingredients until smooth and of a consistency that you can â€œpaintâ€ on to the cookies. Using a pastry brush, brush all over the cookies, into the crevices. Sprinkle with edible white glitter or sparkling sugar or regular sugar. NOTE: Edible glitter and sparkling are available on the web thru various cooking supply sites â€“ such as King Arthur Flour.com. Prepare an 11×17 inch-baking sheet with parchment, silpat, or wax paper. In the top of a double boiler over simmering water, melt semi-sweet chocolate. Stir occasionally until smooth. Do not let water boil. When melted, spoon chocolate over surface of prepared pan to make a thin layer. Let harden. Meanwhile, in the top of a clean double boiler, melt white chocolate. Stir occasionally until smooth. Remove from heat when melted and stir in oil or extract. Also, stir in chopped hard peppermint candy. Spoon over hardened dark chocolate and smooth over, pushing gently on chocolate to spread to the edged of the dark chocolate. When hardened, break in to pieces with hands.